I am incredibly sentimental and Oscar wears the same Horseware headcollar today, as he did the day he came home to live with me, over 5 years ago. I wish I could say the same about the lead ropes, unfortunately we've snapped many of those! I remember choosing it so carefully, I wanted blue because ideally I was looking for a gelding. 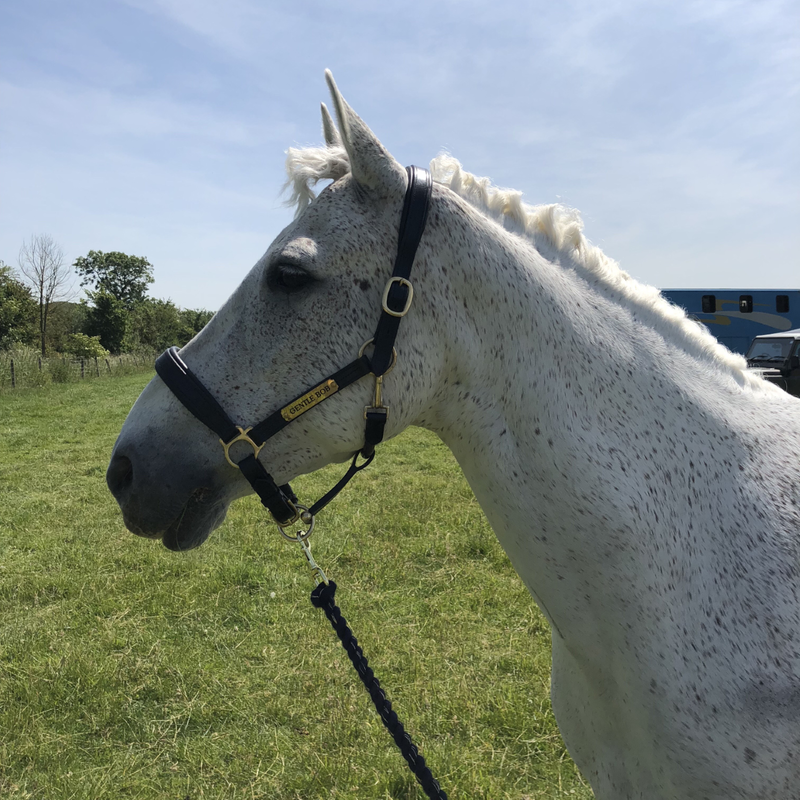 Cob size, knowing he would be a Connemara and by Horseware because of my trust in their brand. that means so much to me on the day we bought him home. It was in March and snow was starting to settle on the ground!! 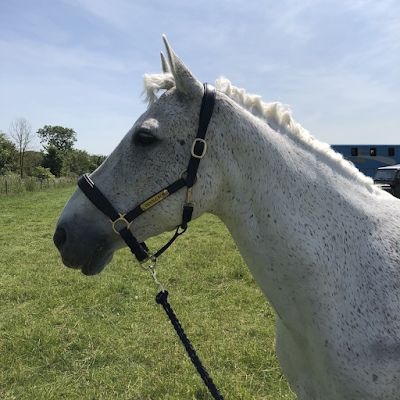 I decided to name it Oscar's 'out out' headcollar and I was recommended by a fellow Facebook friend and Connemara owner - also a fellow Jess - to buy a Brass Tacks Nameplate. I had it engraved with Oscar's Sunday name, this cost £19 including P&P and Jess assured me I could fit it myself. The Brass Nameplate arrived in excellent time, including easy to follow instructions, all I needed was a leather hole punch and it took all of five minutes! My competition clothing dilemmas usually involve finding a jumper slim enough to conceal under my tweed, whether to pack an extra pair of tights and what thickness of glove to go for. Never how not to overheat until last weekend! I took Oscar and his handsome friend Ronnie showing, where tack, turnout and tweed matter more than anywhere else in the equestrian world. With the knowledge that removing my tweed jacket would be out of the question, I knew it was time to update my breeches. They're older than I'd like to confess to and the seat is a little discoloured from saddle soap, yet I always smile when I slip them on because they still fit me and aren't going anywhere near the rubbish bin for some years yet. But I needed something more technical; my brief...breathable yet classic. Although I was baffled by the science and trademark logos I loved the classic design of the Tri Factor Breeches. The tan colour is the perfect shade, the faux pockets on the back look smart, the thick waistband is a perfect height and the muted Ariat logo on the left thigh meant they ticked so many boxes, I purchased a pair immediately. Knowing Ariat sizes can be a little generous I chose a 26"R and I wear a size 8/10. The weatherman had got it right and Sunday was hot. Arriving back to my truck and trailer at midday, the thermometer was showing 32 degrees. My Ariat Tri Factor Breeches were a fantastic choice, I was cool and comfortable in the saddle during my classes. With the hot weather set to continue, a good investment made.